We get into the car to go to the bus office. A couple of Dutch girls from the hotel join us. We ask how much. He says $5 each, to which we immediately protest loudly! We don’t care that he is going to two different offices – the amount is outrageous! One of the backpackers says firmly, “$1 each.” Faced with three fierce feminine scowls, he nods. Not a peep from the other male in the car. That moment confirmed my earlier perception that some people will rather be over-charged than cause a ruckus. I have constantly cautioned my husband to remember the current country’s rate of exchange so we aren’t (too) over-charged. Well, he’s on vacation and has a laidback attitude regarding service charges. I think it’s because he knows that Central America is a poorer part of the world and to him, it’s alright if they ask for more than the going rate. If the taxi driver says it’s such and such amount to get to wherever, he says okay. To me, knowingly demanding more than the going rate is gouging. We already pay way more than what locals pay. At Lago de Attitlan, we were always told Q30. 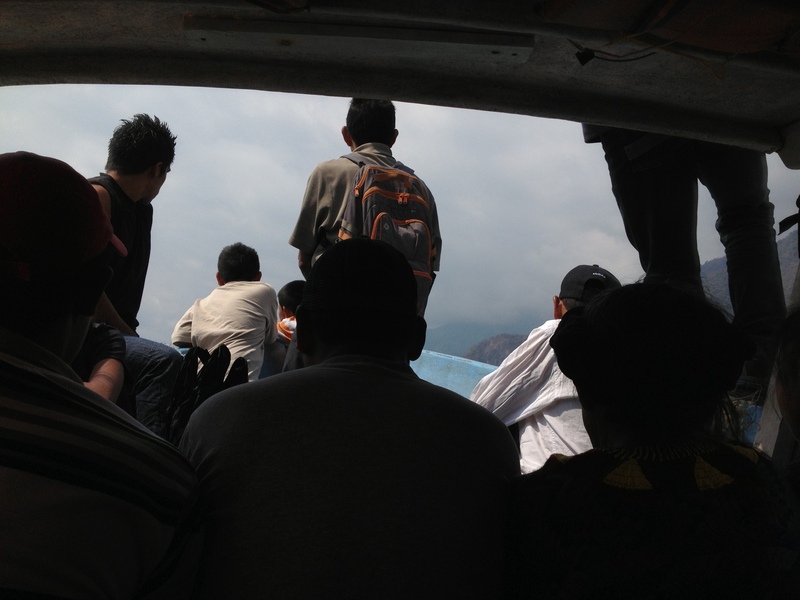 If you paid more than Q25 to ride a launcha to a few villages ’round the lake, you were over-charged. Some tourists were able to bargain down to as little as Q15. Locals, if I remember correctly, pay Q3 to Q5 per person. 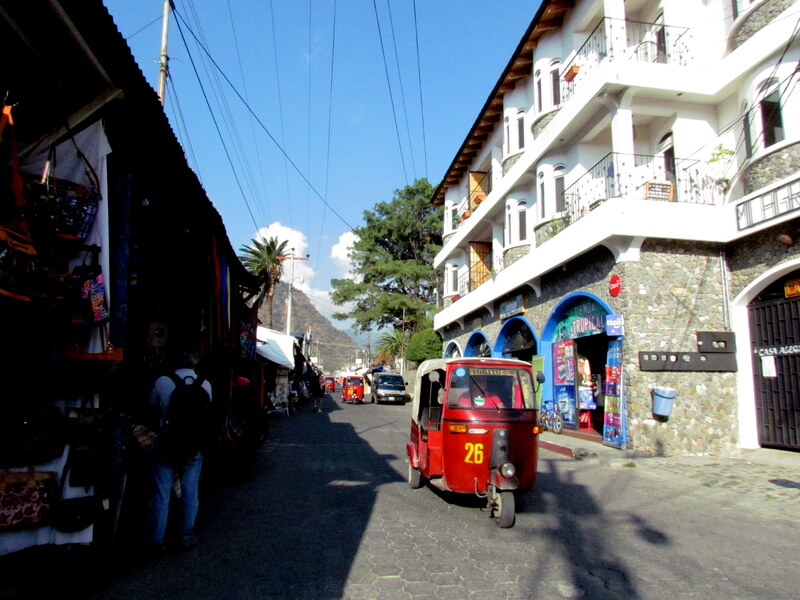 If you ride a tuk-tuk in Panajachel, the biggest village on the lago, it’s Q5 a person. Locals pay Q1 to Q2 a person. Eventually, Lonnie started showing me his change before pocketing it. A few times I had to swing his open hand with the change back to the merchant and tell him/her that we have more change coming back. We’d get more change and an un-apologetic look. It must be a game to see how observant tourists are. Now, back to Granada … we get to the bus office and it’s locked. A woman at the open doorway next door says that they won’t open for a while. We’re taken to another location that is open. The reservation we made is nowhere to be found. A Canadian backpacker says he’s going on a bus that will take us to Costa Rica. He asks if we are going to Monte Verde too. No, we’re going to San Jose, Costa Rica’s capital and the country’s largest city. He says we can all go on the same bus as it will stop briefly and let him off on the way to San Jose. What a nice guy! Another warm day in Granada. We decide to get out on the water. Nearby Lago de Nicaragua is the only freshwater lake in the world that has sharks, though a local told me they’re rarely seen. The sharks have been severely overfished and a hold has been put on hunting them. Hopefully, it brings the numbers back up. 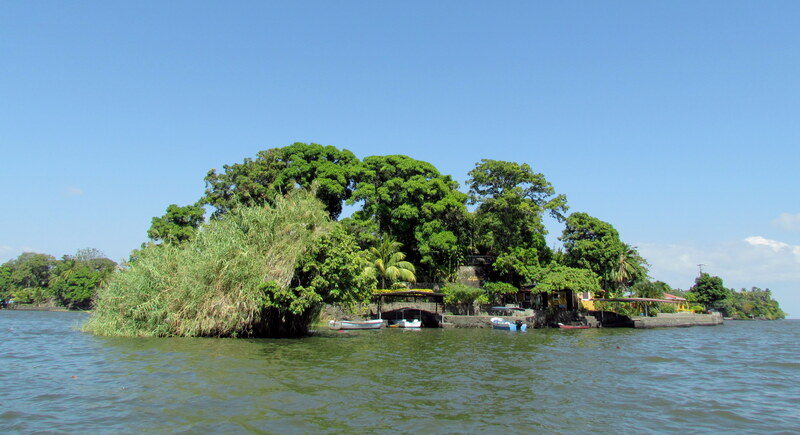 It is said that the 365 tiny islands in the lake were made when Volcan Mombacho had a ferocious eruption and spewed bits and parts into the lake. I can see that possibility, as most of the islets are like tiny tree-topped blobs, dotting the waters. Telephone lines stretch across the lago, connecting homes that are fairly close to each other. Many of the islands we pass are concrete reinforced, allowing for more stability and enlarging surface areas. The island in the foreground, Isla Jacqueline, looks like paradise. I think I spied a ball court and play area! 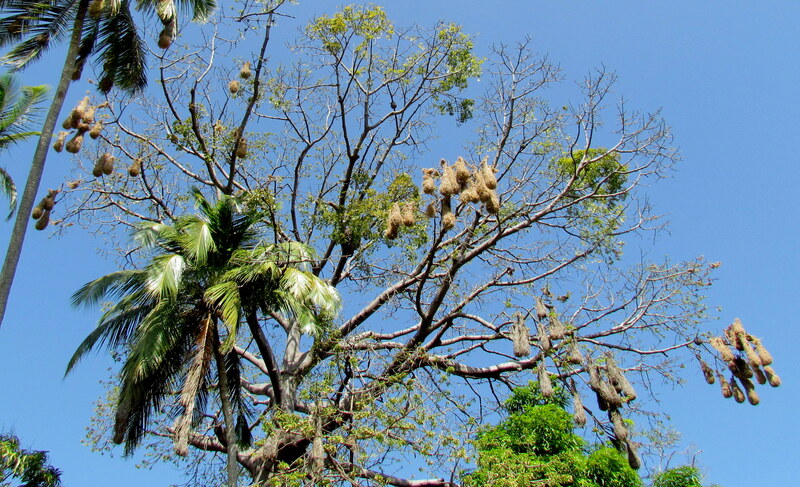 The hanging sacs are actually bird nests! 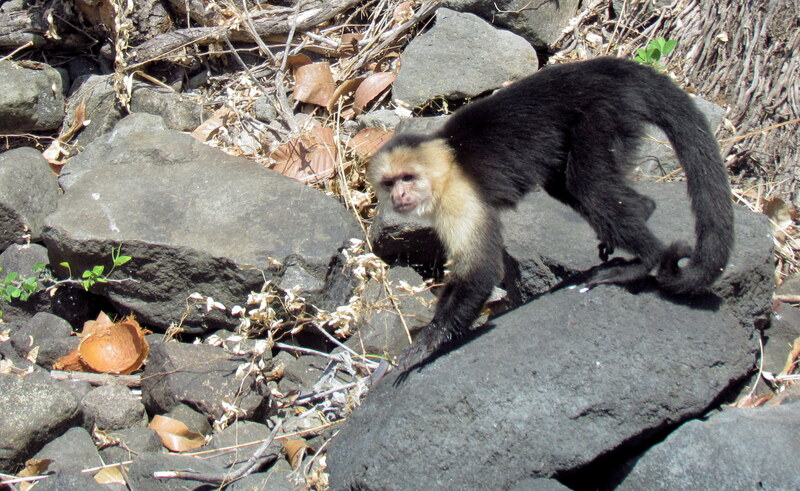 This capuchin monkey’s stranded, like on Gilligan’s Island. People boat by, but never rescue him! Please don’t throw chip bags on the island. 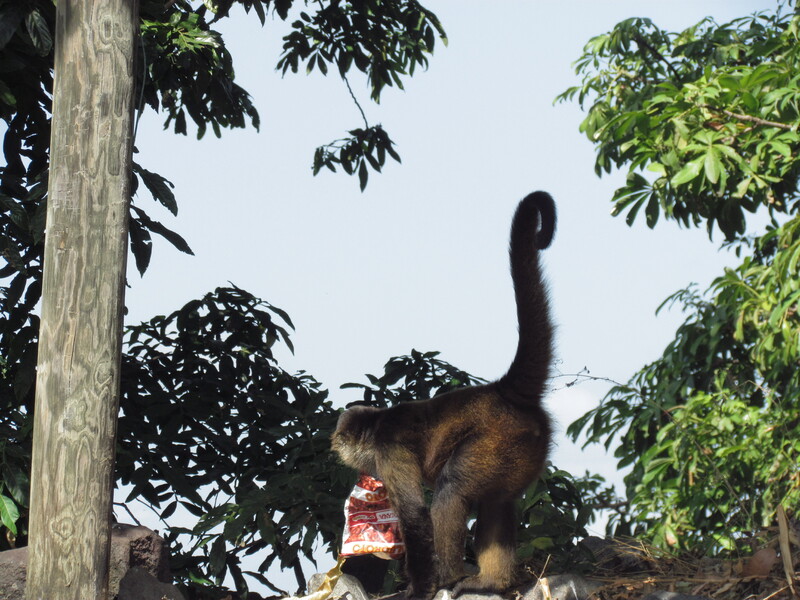 This howler monkey, the capuchin’s island-mate, is a curious sort. Lunchtime! Our guide takes us to an island restaurant. We place our order and enjoy the quiet just before a noisy tourist boat arrives. It becomes pretty crowded as there’s just so much space. 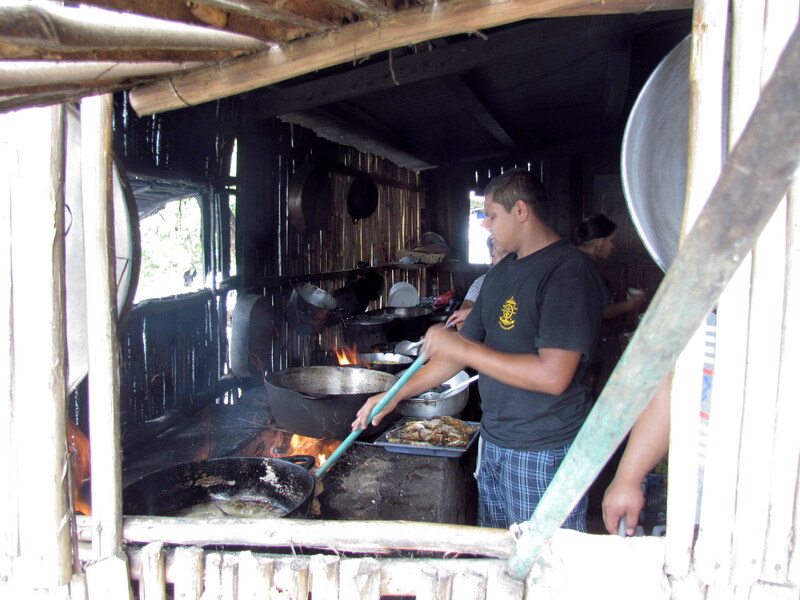 We stop by an island restaurant for their specialty, boneless fried fish. It’s a popular tourist spot. Later, Gerda takes time away from her biking tour buddies for an evening walk around Granada with us. We stop for dessert before strolling over to the plaza. The International Music Festival is a high energy event. Some of the spectators get carried away! We finally make it to Granada! It’s already starting to feel HOT. Maybe a visit a month or two earlier would have been better. Oh, well. 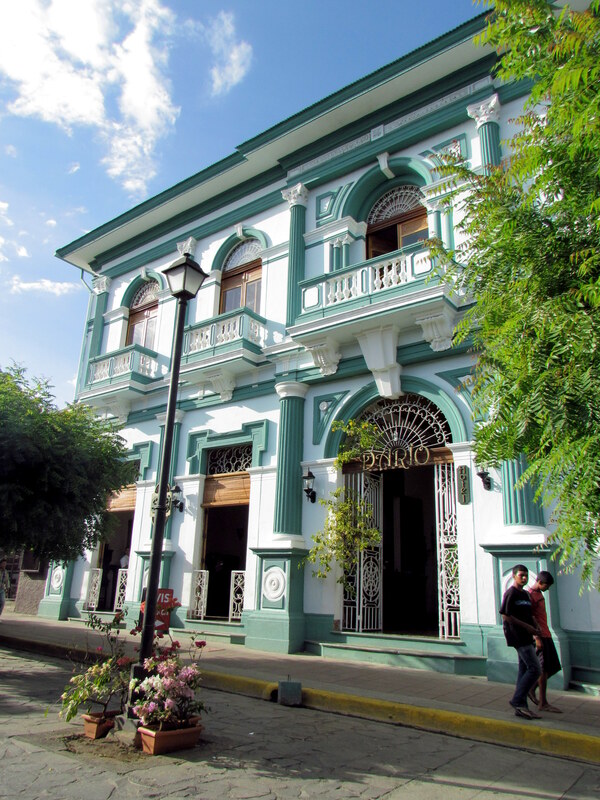 Granada’s a quaint city with Spanish influences and is sister city to Guatemala’s La Antigua. It’s said to be the first European settlement in mainland America. If the claim that it’s registered in the official records of the Crown of Aragon and the Kingdom of Castile in Spain is true, that, indeed, bespeaks of royal acknowledgement of an exceptional lineage! 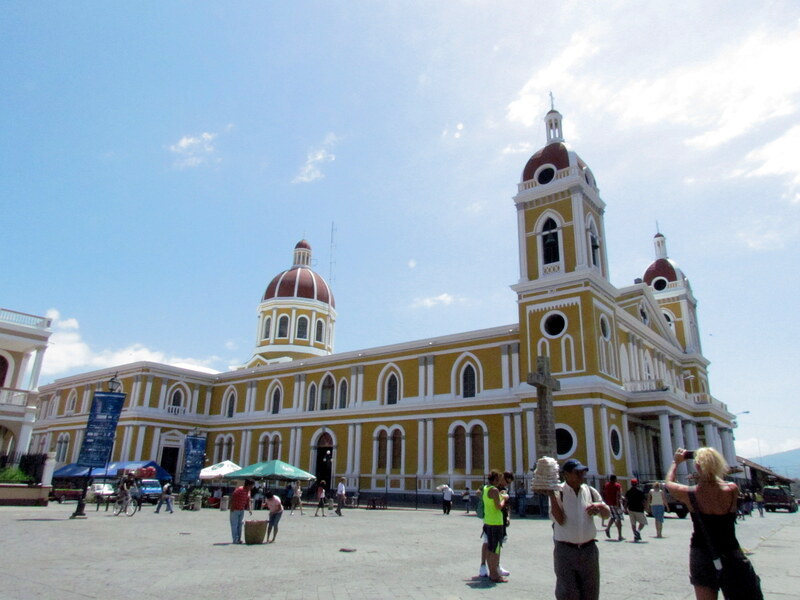 Granada may have been spared major damage from the Sandinistas in the 1970s – 1980s, but an earlier history of battles and invasions from other countries, a long-running, often violent feud in the mid 1800s with neighboring city, Leon, and other issues have taken their toll. 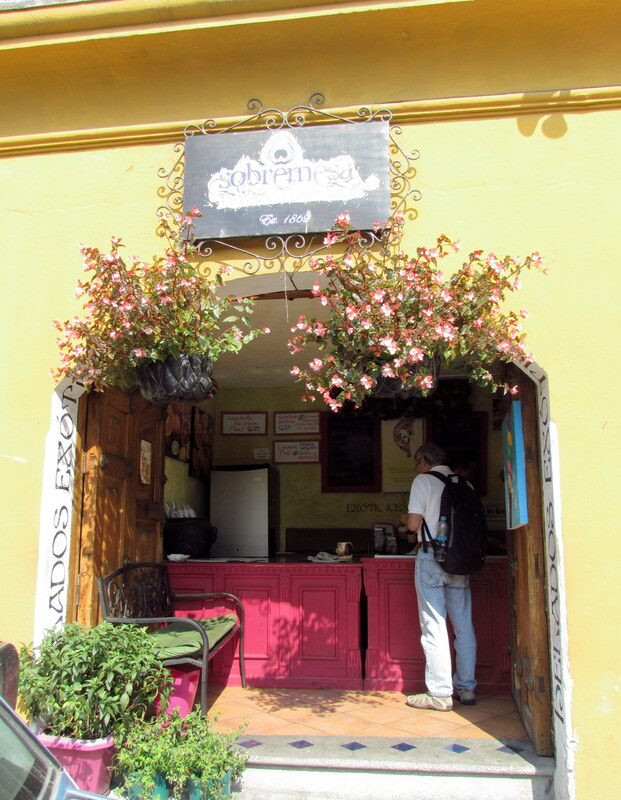 Although Granada (named after the ancient Spanish city) is not quite as well-maintained as its “sister”, the past decades have seen an attempt to revitalize the city and save its ancient colonial architecture. Judging by the variety of indoor shops and decent eateries here, the city is becoming a more desirable tourist destination. 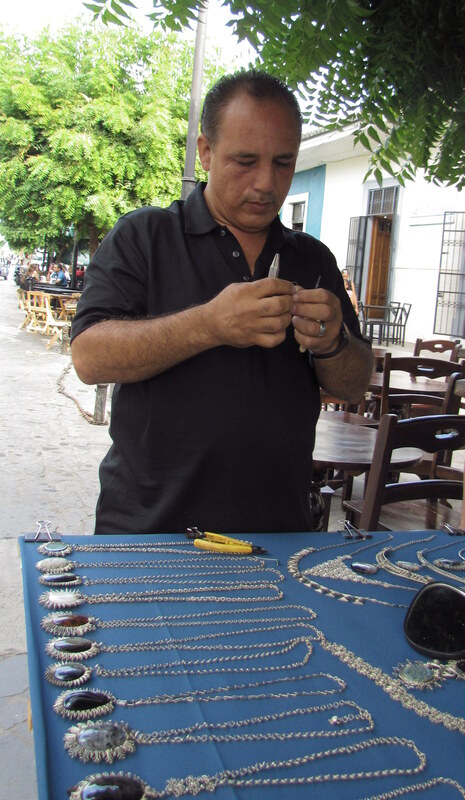 We stop in the “calle peatonal”, pedestrians only street, to sip a beverage, watch people go by and browse the vendor tables. Using just a reed and a snip from small scissors, this boy creates a heart with arrow through it. 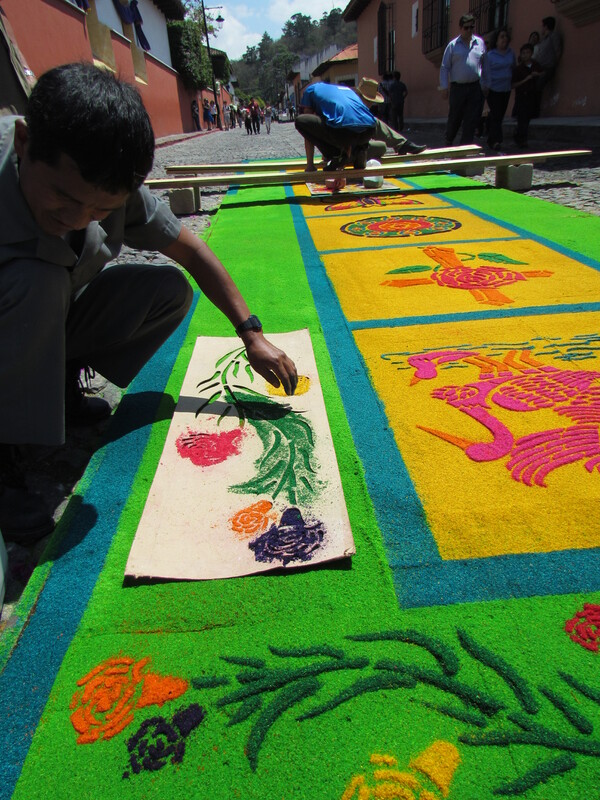 At any age, artists work hard to make a living in Central America. 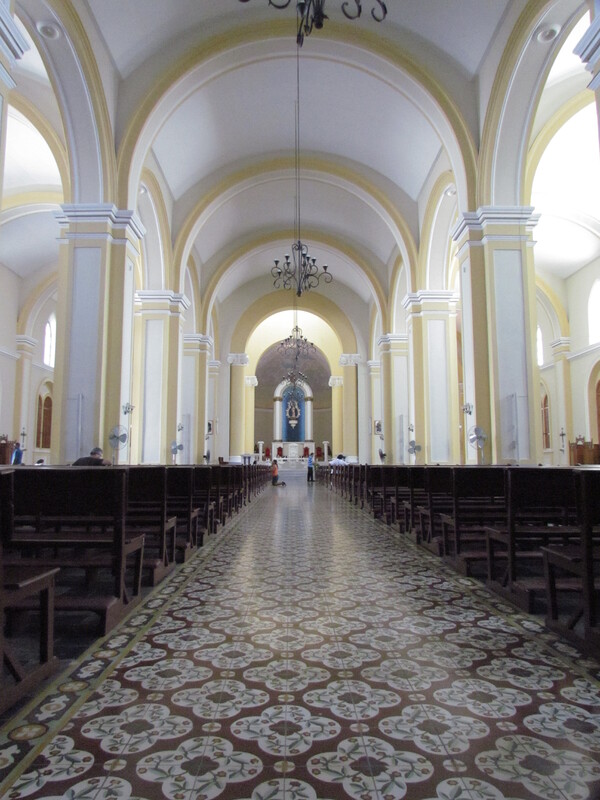 Iglesia de San Francisco is considered to be the oldest cathedral in Central America. Sadly, the famous robin’s egg blue paint seems to have faded. 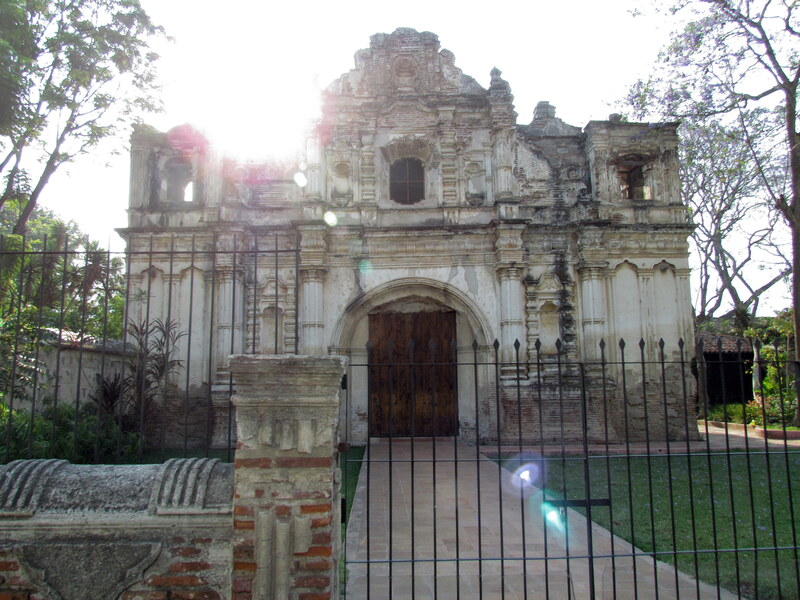 Iglesia de San Francisco’s current building is fairly new – in 1524, it had wooden walls and a straw roof. It burned down about 160 years later to be rebuilt as a sturdier structure. In 1856, it was intentionally burned down by the infamous American scoundrel, William Walker. His men set fire to the city when they left, destroying most of it. Walker was a power hungry mercenary who schemed to become President of Nicaragua with a goal to control all of Central America. Those other Central American countries took exception to the idea. Walker didn’t rule very long, a year perhaps. It’s said that in 1860, he was hunted down and executed in Honduras. Catedral de Granada is a boldly painted church in the plaza. The sprawling building is quite prominent! The cathedral’s first structure was built in 1583, destroyed by the previously mentioned 1856 city fire, then completely rebuilt by 1915. To view more Granada iglesias, visit http://felipedelbosque.wordpress.com. 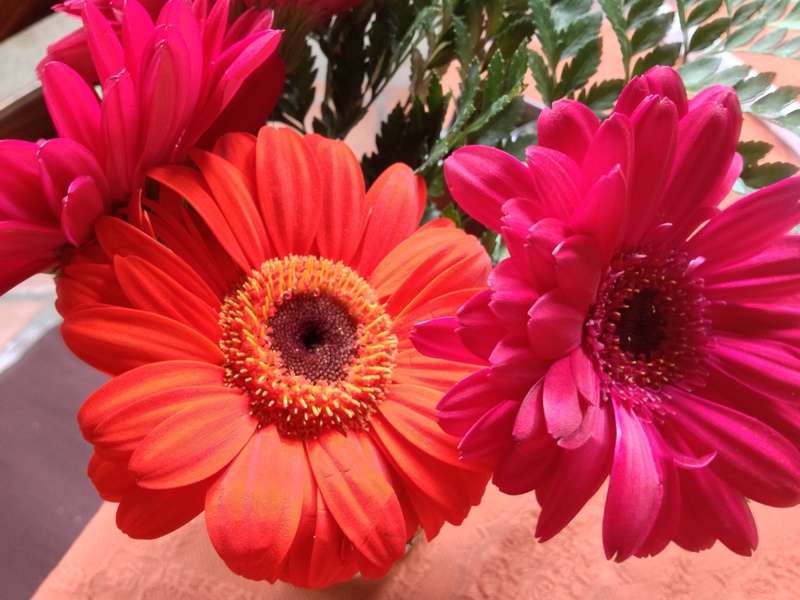 All around us, the city shows off its bright colors! The Baroque style with Moorish influence is quite evident. 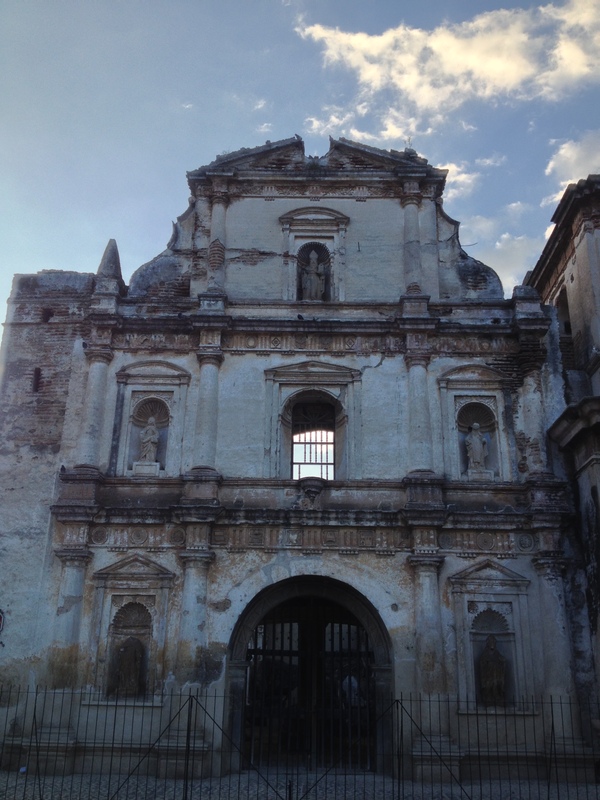 Granada is waiting to see if it qualifies for the World Heritage List. Many styles of architecture abound! 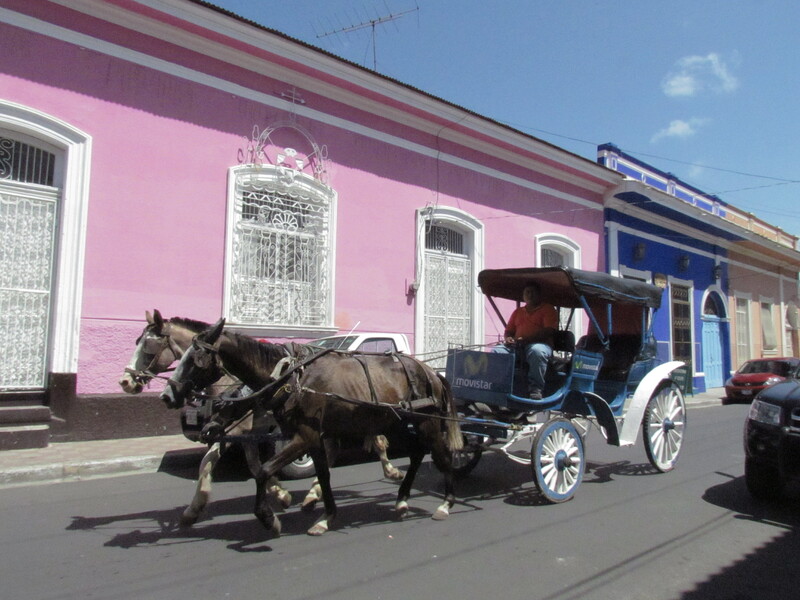 A horse-drawn carriage goes by cheerfully painted houses. Life in here seems to be slow and easy. I was pleasantly surprised to see wrapped vegetables! Often, you will see darling children, such as this one on the right, on my blog. Except in crowd shots, I always ask for permission to take their images if they are recognizable, be it for a photo or video. It’s a habit from working in media. It’s also the right thing to do. 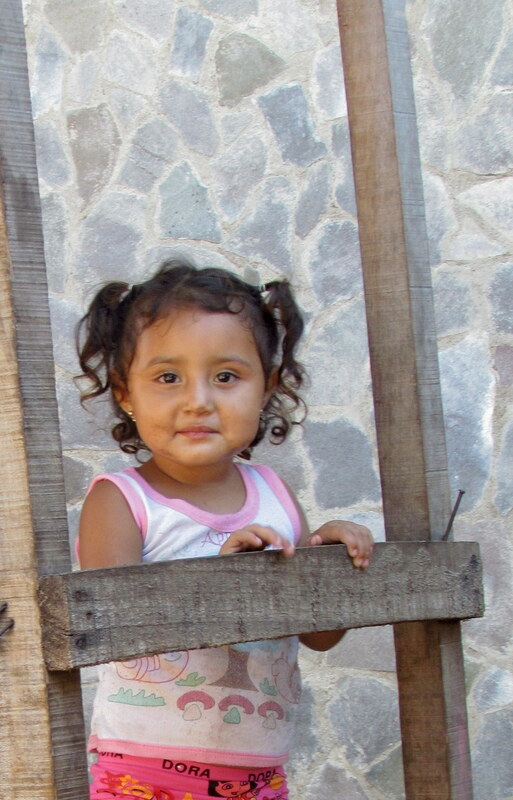 Especially in Central America, parents are very protective of their children. Several times, a negative shake of the head was sent my way and I moved on. Tip: Please respect the cultures of countries you visit. 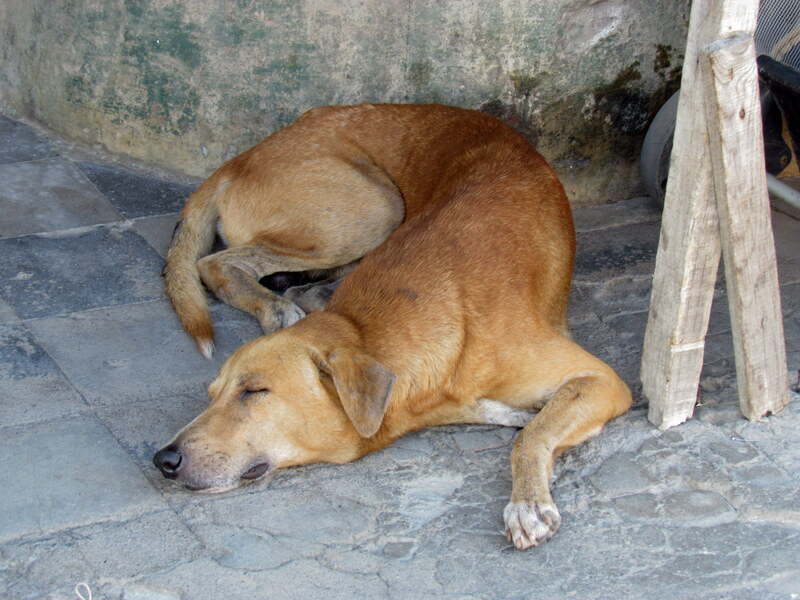 I noticed that if I very politely and smilingly communicated with locals, they reciprocated. English-speaking locals or ex-pats were very kind to explain local customs. Tip: If you are looking for a change of scenery, Granada offers a low cost of living, attractive incentives for foreign investors such as limited tax breaks and there are few restrictions on foreign ownership. Just be sure to visit before any decisions are made. The present situation regarding Central American children seeking refuge in the United States is disturbing. There are strong, emotional pros and cons on both sides of the issue. I won’t go there. I just want you to know the beauty I saw there earlier this year. 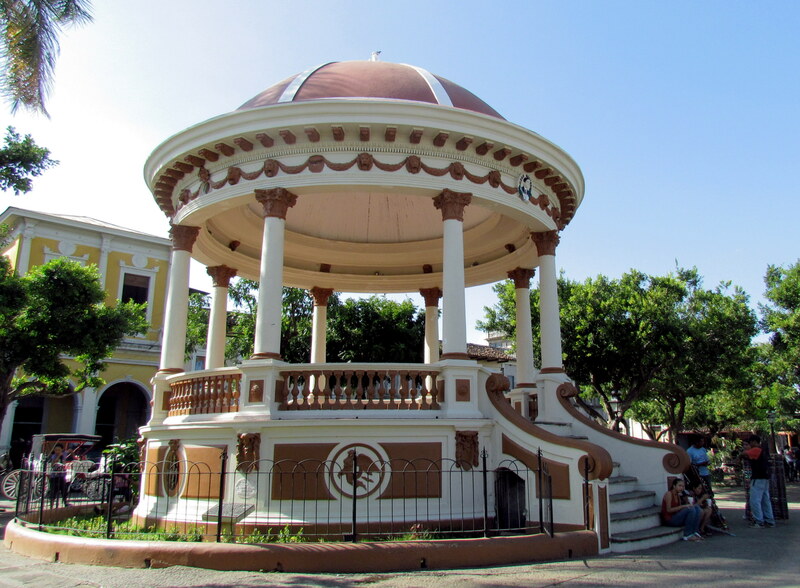 In 1524, the Spaniards established two settlements in what is now Nicaragua. The pre-Colombian Indian civilization there was decimated by their cruel acts. Strange foreigners with powerful weapons came ashore, seemingly out of nowhere. They forcibly took land, tore apart families, forced relatives to toil for them and sent others off on slave ships, never to be seen again! And to top it off, the Spaniards brought deadly diseases that no one had ever experienced before, slowly and painfully killing off the population. So began a tumultuous history through multiple centuries. From power struggles, becoming a part of the Mexican Empire, breaking away from Spain (1821), an American mercenary becoming Nicaragua’s president (1856), assassination plots, horrendous civil war crimes, terrifying dictatorships, the U.S.’s unwanted presence, the birth of guerrilla warfare, government corruption and the list goes on and on. Nicaragua may be the largest of Central America’s countries, but it is the second poorest country in the Western Hemisphere. No wonder it is still trying to recover from centuries of turbulent upheavals! I hope the time we spend here helps a tiny bit towards that recovery. 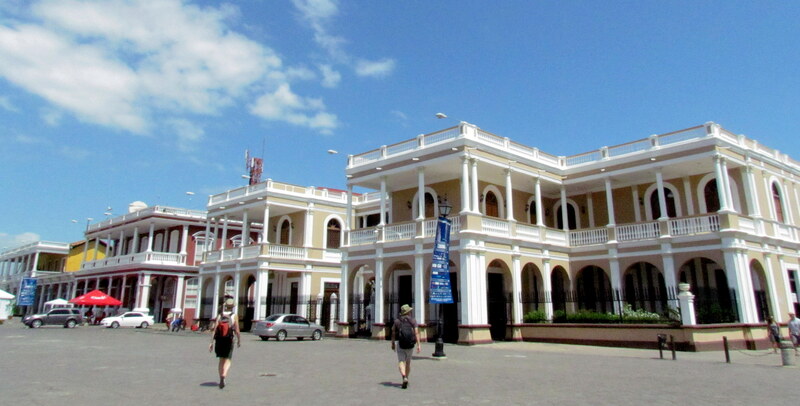 We arrive in Managua, Nicaragua’s capital. The plan? 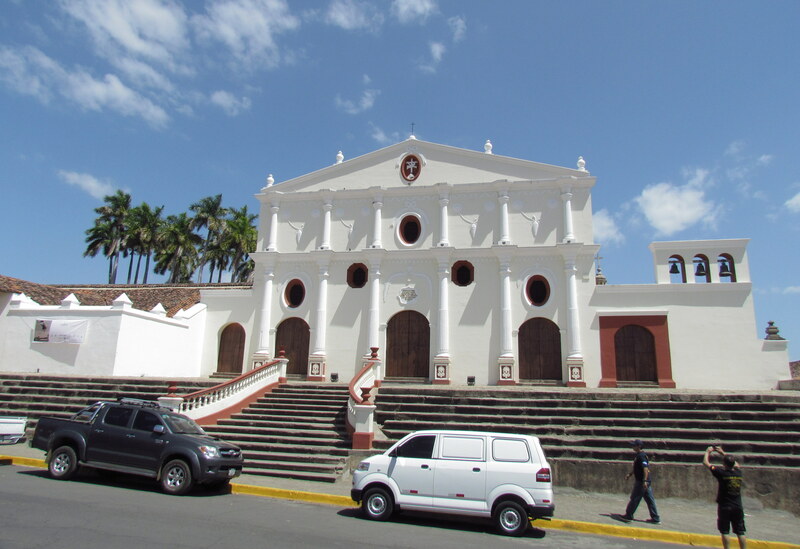 Leave the next day for Granada, a city known for having some of the finest colonial-era architecture in the country. We spend the night at a backpackers’ lodgings. Oh, joy! Our room has a private bathroom and is air-conditioned. Next morning, as we prepare to leave for Granada, the owner introduces us to another English-speaking tourist. Gerda’s from Canada. She’s a veteran firefighter from the Northern Territories. Gerda is enthusiastic and persuasive. Very persuasive. She talks us into going with her to Chocoyero-El Brujo Natural Reserve, a secluded tropical forest in Ticuantepe, outside of Managua. It’s named after the green Pacific Parakeets known as Chocoyos. A local taxi takes us on a jarring, pothole-filled ride up, maybe an hour. 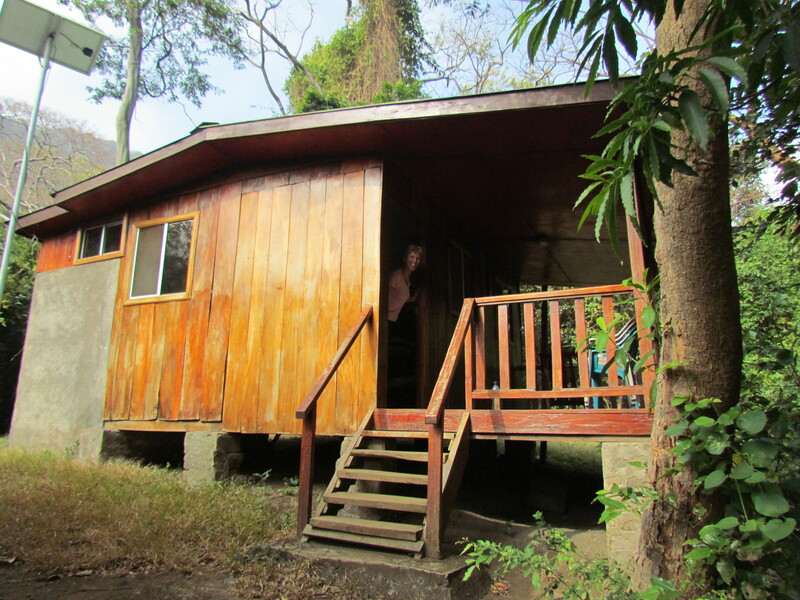 We three are the only overnight guests in the 455 acre tropical forest. We go up a steep, three tiered walkway. Lonnie & I have the bungalow. Gerda has the bunkhouse all to herself. She has electricity, but just a trickle of cold shower water. We have cold water, but no electricity. (The bulb blew out twice.) Out come the headlamps! At least we have mosquito nets. With the two screen-less windows shut at night, it was pitch dark. The cabin could have used a really, really good cleaning, but since the reserve is operated by (wilderness) men, that’s not going to happen. Alan Pasos is our very competent guide for the morning, evening and 5-hour hikes. He goes home each night after our dinner and two others keep watch overnight. Alan’s English is good enough that we communicate reasonably well. For two days, he leads us on nighttime and early morning walks to the two waterfalls, often pulling out a birding book to identify a species. He took several of the photographs below, often nimbly scurrying up trees and steep terrain! We walk silently behind Alan, watching for his signal to stop as he listens for animals traversing the brush and trees. We must be quick to see a furry animal slip across the path or rustle through trees, many pairs of hidden eyes following us. Alan finds a BIG, squiggly night crawler. Of course, Gerda has to pick it up! I was surprised to see a little crab scuttle across the path! An owl eye butterfly. The eye scares away predators! One of the days, Alan and his father take Lonnie and Gerda on a mid-day five hour hike. Steep terrain, stringing ropes from tree to tree and unstable paths causing mid-air dangling at times! A hammock is on the cabin porch, tied. It’s so pretty! Tip: If you see a hammock lying around, ask for help. I ask. They climb up, wrap and tie the ends. I swing on it, daydreaming, until motion sickness sets in. Time to climb down and write in my journal. Later, I take my cell phone down to the lobby to charge – that’s a pleasant surprise! I bring a puzzle from the suitcase. Spend a little time there before leaving the puzzle for another lazing tourist. Lonnie comes dragging in, cut and bruised. Gerda bounces in behind him, dimples flashing, eyes alight with the joy of testing one’s endurance! She had wanted the six hour hike, but that would have pushed past Lonnie’s limit. Lonnie shows his hiking wounds to Cricket. Each morning and evening, Alan would lead us to the waterfalls to be amazed at the hundreds of chirping birds roosting in holes in the limestone walls. We peek in a few holes after the birds fly off and there are crickets, too. Alan is so dedicated, making sure we see the beauty of his forest. To me, it’s a jungle, with long, trailing vines and lush foliage. We see so many interesting inhabitants and plants that make up the teeming life of the woodlands! Alan’s mother cooks our meals. 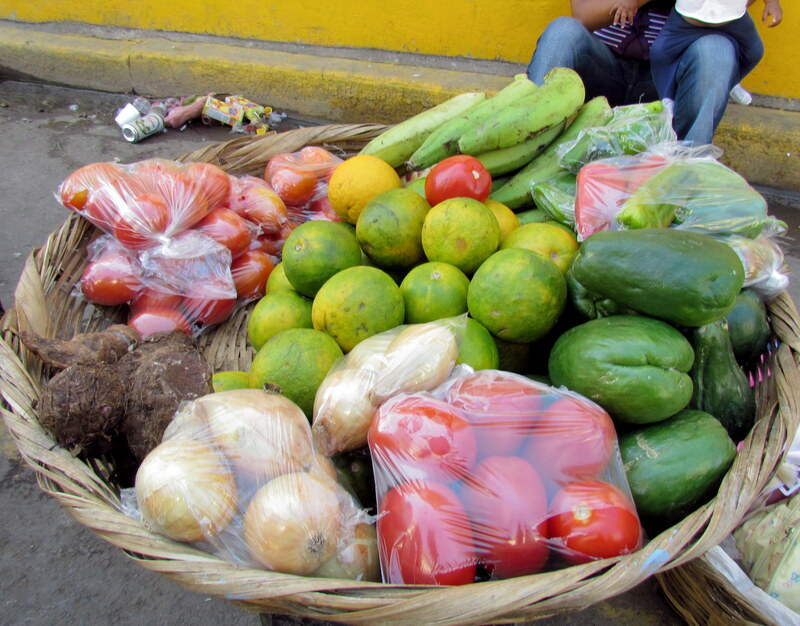 We eat beans, rice and plantains … three times a day. I find out that plantains can be boiled, fried, grilled, smashed, mashed and sliced. At breakfast, boiled eggs and stewed tomatoes are added. At lunch, boiled eggs are added. At dinner, a piece of chicken is added. There is a cup of delicious fresh squeezed orange juice with meals. Gerda, the ever polite Canadian, asks to meet and thank Alan’s mother in person. Gerda brings treats for the children. Seeing the dirt floors and little chicks running around, we realize how fresh our meals are! Alan picks oranges along the way for juice later. 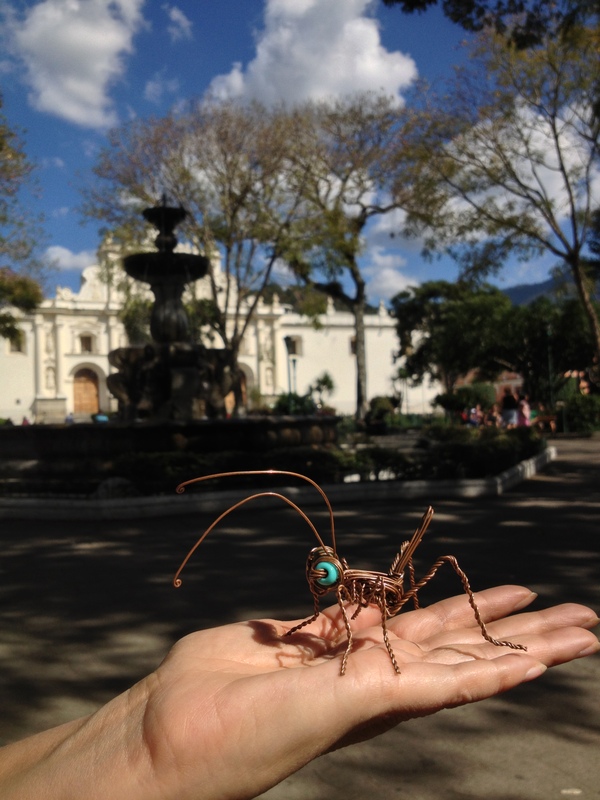 Gerda starts a two-week bike ride through Central America this weekend. She brought school supplies for the tour donation, but decides the elementary school down the road needs it more. 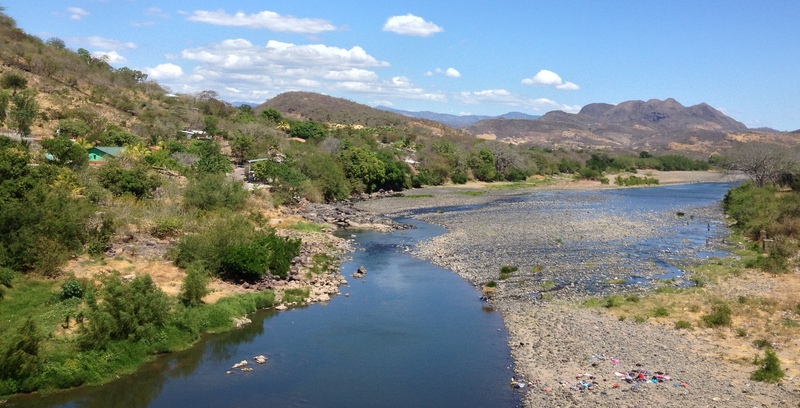 We add a monetary gift and start walking toward Escuela San Jose de los Rios. We visit classrooms and go out to the courtyard where we officially present our gifts to the principal of the escuela, Senor Corea. Gerda and I sit with one of the classes after passing out bags. Gerda included Canadian maple leaf pins! While we are passing out bags, the exterminator begins fogging. Unfortunately, it is difficult to get service in an isolated area. They come when they can. 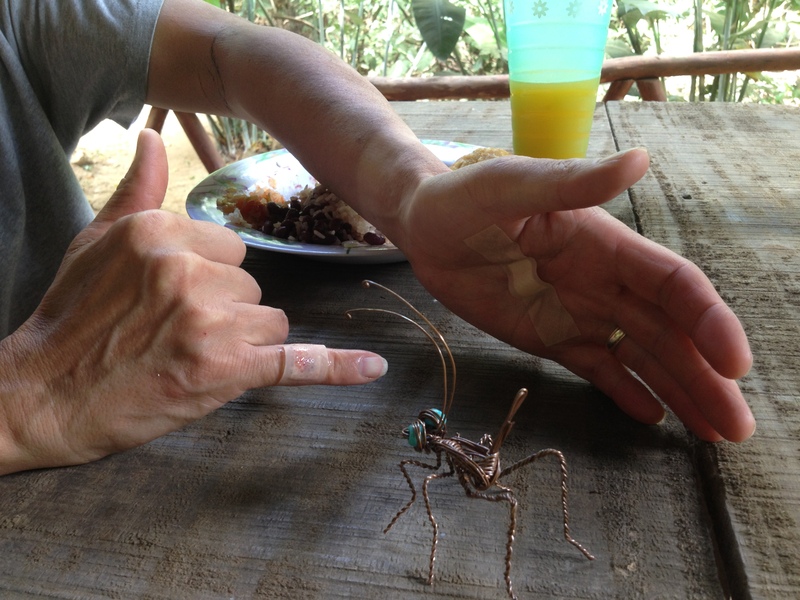 If you are planning to visit Nicaragua, consider Chocoyero-El Brujo. 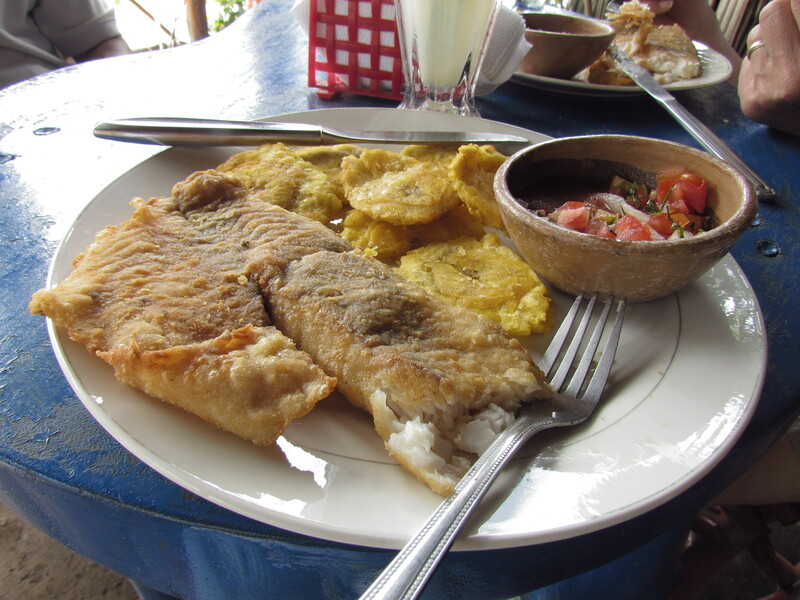 Tip: It is one of a handful of Nicaraguan nature reserves that allows camping. To wake up to screaming howler monkeys or the raucous chatter of thousands of little green parrots starting the day is so cool! You can bring your own gear or reserve the bungalow or a bed in the bunkhouse. Tip: Contact the reserve as early as possible if you plan to stay there. It may take some time for them to email you back, but it’s worth it. I don’t know if Alan even has international calling on his phone. Gerda tried calling, unsuccessfully, for weeks from Canada to confirm by phone. In Nicaragua, she was able to get through. You’ll learn a lot with Alan and you’ll be helping a country that can use all the help it can get. And please tip generously! This is a cooperative that is not government funded. 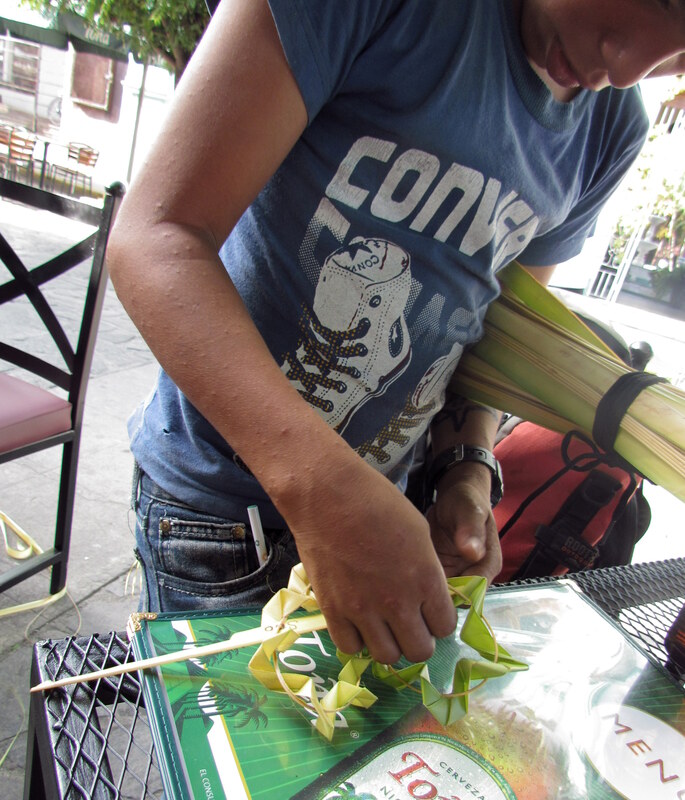 Alan says that the people who maintain Chocoyero are volunteers who are paid ONLY when there are visitors. Life in the forest is hard. Tour companies may bring in daytime visitors, but with their own guides. You can click on Tripadvisor to read recent reviews. 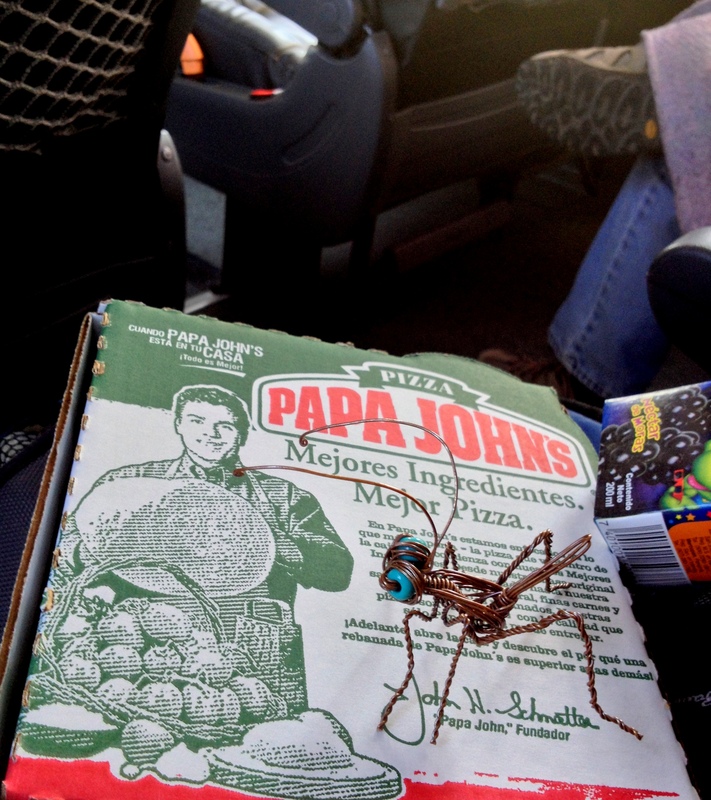 February 11, 2014 Bus to Nicaragua! Cricket here. I am named Cricket, not because I am a cricket, but for the famous 1960s actress (Connie Stevens) that was named Cricket in the TV show, Hawaiian Eye. Cricket was a singer. Crickets can usually “sing.” I do not sing. Cricket the singer was very pretty. Soo thinks I am very pretty too! Head rest covers are the best place to view the countryside! I am so excited! This is my first bus ride. We take a Del Sol executive bus. It is very nice. Soo says it is much better than ADN or Litigua buses. At our 1:30am boarding, the nice attendant passes out pillows and blankets. At 8am, we transfer buses in El Salvador. Along the way, we have visits from immigration, then transportation agents, a drug sniffing dog and customs inspectors. We have two meals. One is from Papa John’s Pizza. I am surprised! We make friends with a man also going to Nicaragua. Rony has a phone. He calls our pre-arranged taxi driver that we will be arriving later. Rony is a good friend. As the bus goes by, I see eighteen wheelers a couple of feet deep into rivers. The drivers are washing their big rigs. Can you see the load of scattered clothes, drying on the river bank? We are finally here! Managua, Nicaragua is a big city. Many taxi drivers are waiting to take passengers away. They are loud. Soo and Lonnie scoop me up and push their way through the crowd. 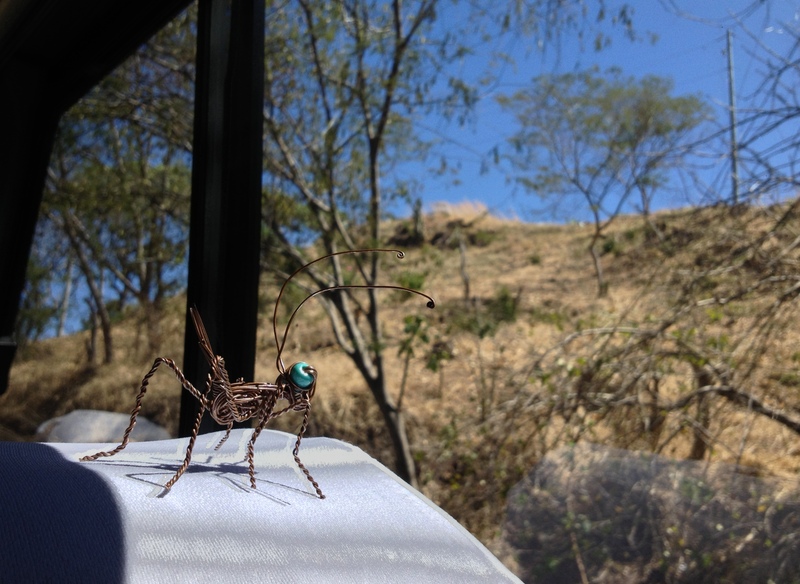 The driver is waiting and off we go on a Nicaraguan adventure! 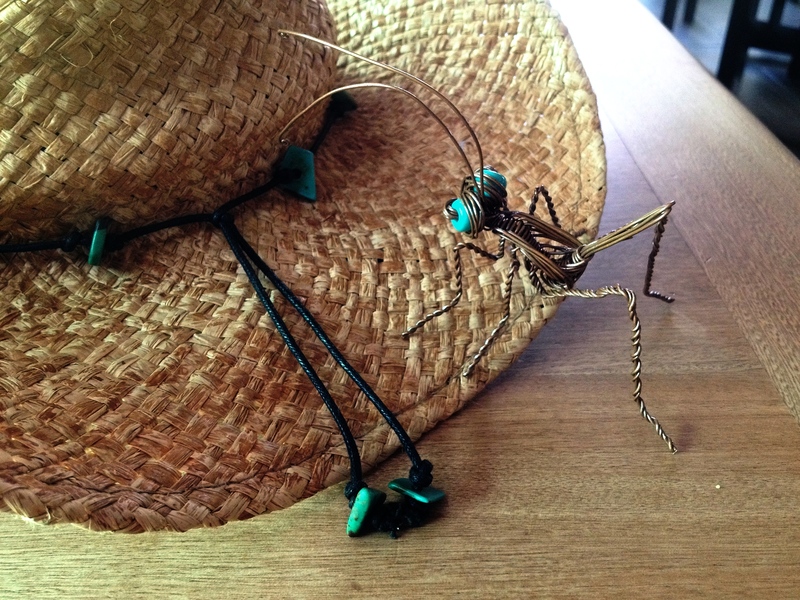 February 12, 2014 Meet Cricket! You will love my lovely hometown! Hola! My name is Cricket. 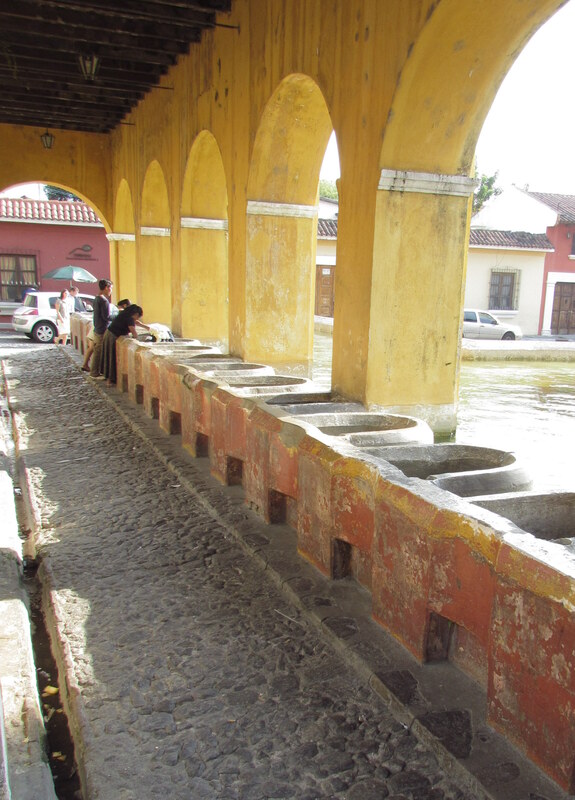 I was born in the central plaza of La Antigua, Guatemala. I am made of twisted wires and two pretty turquoise bead eyes. I have looked for other family members, but it seems that they are not nearby. It is good that I am curious and make friends easily. Let me show you some of the lovely things in my picturesque hometown. 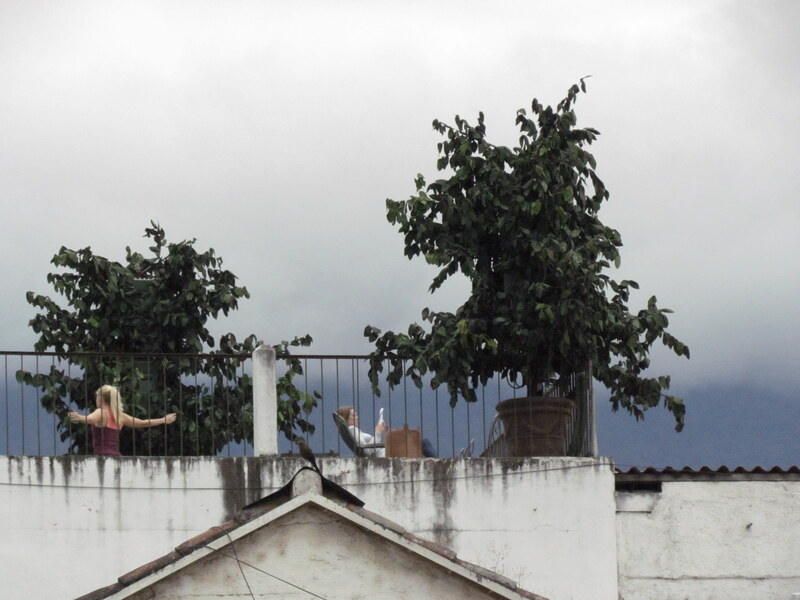 Rooftops are perfect for exercising and reading! 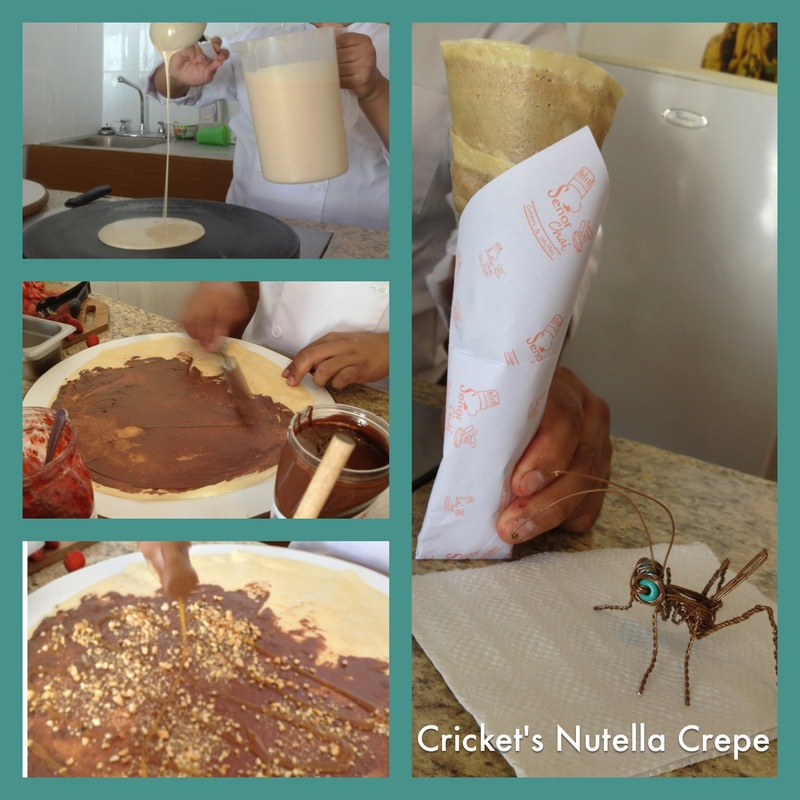 Exotic ice cream creations to tickle your taste buds! Though not considered lovely, the painted public wash tubs have seen decades of dirty clothes. There are many pretty flowers here. We’ve been unavailable the past week and are now back on land and re-connected. Should be posting more soon!